provides a study guide collection that equips your teen to dig deeply into C.S. Lewis’ beloved chronicles. Homeschooling high schoolers should revisit these great books in order to study the theological and philosophical concepts imbedded in the stories. The 7-book series The Chronicles of Narnia is not just for kids! As always, 7 Sisters’ Literature Study Guides contain NO busywork, just the important take-aways from each book. understand C.S. Lewis’ life and world. 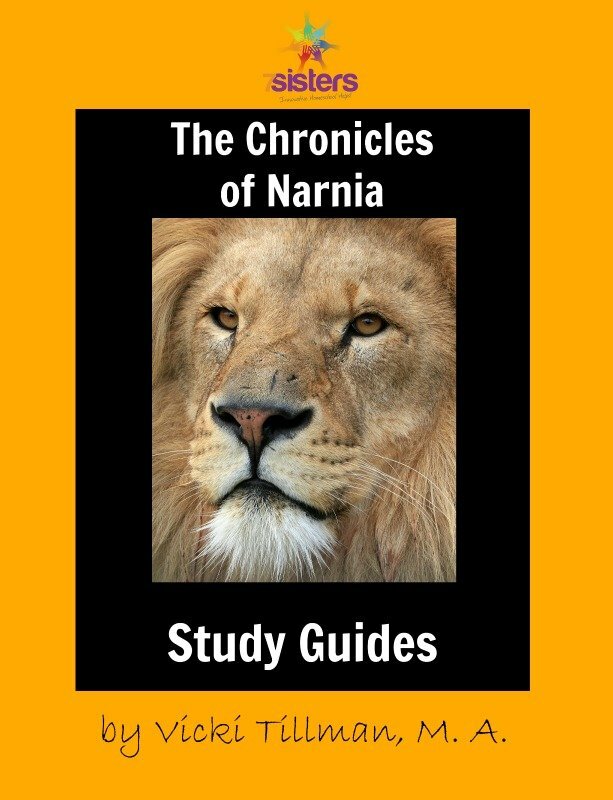 The Chronicles of Narnia Literature Study Guides: Complete Set for High Schoolers comes with study guides for seven books, each complete with explanation of the theological or philosophical ideas in the text, myth-fantasy writing tips, vocabulary, questions for each chapter, and answer key. The guides provide lots of great information but no OVERKILL that would take the joy out of experiencing the book. The study guides in this Narnia high school curriculum were written by Vicki Tillman. No one outgrows The Chronicles of Narnia! High school is the perfect time to revisit them! Study Guides for individual books are also available separately. Click here to view an excerpt from The Chronicles of Narnia Literature Study Guides: Complete Set. What are homeschool parents saying about The Chronicles of Narnia Study Guides? “I am using your literature series with my sixth grade daughter as we read “The Chronicles of Narnia”. We have completed “The Lion, the Witch and the Wardrobe” and “Prince Caspian” to date. She is a strong reader and enjoys the challenge of answering the questions of this series. I like that some questions can be answered briefly while others require a more detailed response. This series has led to many nice discussions as well as additional writing assignments! Keep up the good work!” – Chris K.
“FIVE STARS. Excellent reference and teaching tool!” – E. A. NOTE: The Chronicles of Narnia must be obtained separately; this Narnia high school curriculum is comprised of the STUDY GUIDES ONLY to accompany the reading of the books themselves. Most titles can be found in your local library, or if you’d like to order new or used copies of these classics, JUST CLICK HERE .